I try not to buy a lot of convenience foods because they are expensive and usually not healthy, but I also like to have fast and easy options on hand for when we need food in a hurry. So I whipped up a batch of these bean and cheese freezer burritos mainly for my husband to grab for an easy lunch when he doesn’t have any leftovers to take. I’ve been putting off making these for a long time, but once I started it went really quick. I love filling my freezer with homemade food because it saves me time and money. Plus, it’s healthier for my family than fast food or prepackaged frozen meals. I bought all the ingredients at Aldi and ended up spending .55 per burrito. You could use the small “taco” size tortillas to make them even cheaper, but these are for my husband so I went with the medium or “burrito” size. Step 1: Mix beans, cheese and Rotel (with liquid from can) in a medium sauce pot over low heat until combined. You don’t want it to get too hot since you will be freezing these, so only heat enough to combine the ingredients. Step 2: Pre-cut 12 pieces of foil. Step 3: Lay tortilla over foil and add approx. 1/2 cup filling to the center. Step 4: Fold tortilla into burrito and wrap with foil. Step 5: Repeat steps 3 & 4 until all filling is used. Step 6: Place burritos in gallon freezer bags and freeze until ready to serve. For serving: Cook frozen burrito in microwave 2-3 minutes or until warmed throughout. Mix beans, cheese and Rotel (with liquid from can) in a medium sauce pot over low heat until combined. You don't want it to get too hot since you will be freezing these, so only heat enough to combine the ingredients. Pre-cut 12 pieces of foil. Lay tortilla over foil and add approx. 1/2 cup filling to the center. Fold tortilla into burrito and wrap with foil. Repeat steps 3 & 4 until all filling is used. 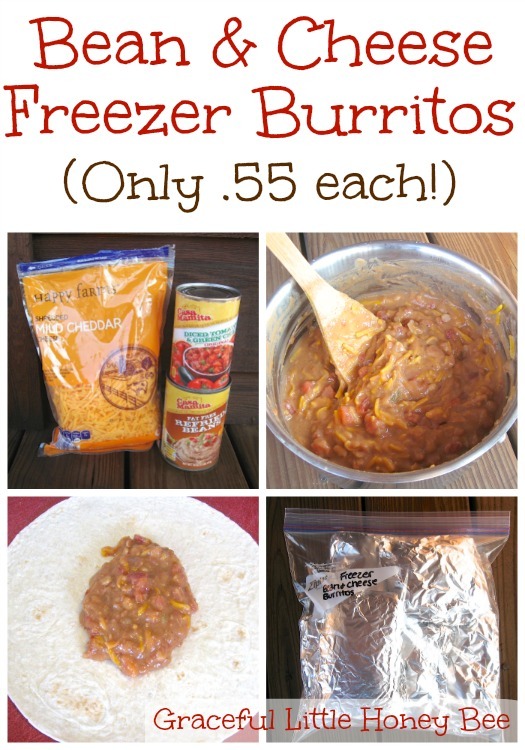 Place burritos in gallon freezer bags and freeze until ready to serve. Thank you so much for posting this, and all of your freezer meals! My husband LOVES bean and cheese burritos and I end up buying the pre-made ones so he an grab them in a rush. This is wonderful1 I'm going to make a batch this weekend! We eat a lot of rice and beans meals in this house also. I love this post! You will need to remove the foil before cooking in the microwave. These worked out so well for us! Thank you for posting the recipe. :) Instead of foil, I wrapped the burritos in a paper towel and flash-froze (froze individually on a pan), then put them into a large freezer bag. The mister grabs one or two from the bag and nukes them at work in the microwave. The burritos have thawed a bit, and the moisture in the paper towel helps to 'steam' them a bit, so they are moist and great! Thank you again! I assume that it is add 1/2 CUP filling to tortilla...not 1/2 the filling. LOL But, my question is...Do you (or, he) notice that they dry out with microwaving? Would it help if you wrap it in a paper towel before microwaving, like you do to breakfast sandwiches? Yes, you will use 1/2 c. per burrito. Thanks for correcting that. I have never noticed them being dry. They are the same consistency as store-bought bean and cheese burritos. I've never tried wrapping them in a paper towel so I'm not sure about that one. Do you know how I could take your slow cooker pinto beans and cornbread dinner and turn the leftover beans into retried beans? I am thinking if I made both these recipes in the same week there would be no reason to have to buy the refried beans! For those of us not in US -- what is Rotel? Is it canned tomatoes? Sorry! It's diced tomatoes and green chiles. You could replace it with salsa if you can't find the Rotel. Hello, could I put these in the oven? Do't own a microwave. Thank you! I"m sure they would be fine in the oven. How much ground beef or shredded chicken can I add to this if I wanted to add them? I would say about 1/2 cup to 1 cup depending on your preference. If you do add meat, you may be able to make more than 12 burritos since you will end up with more filling. Awesome! I've heard of a lot of people doing this, but I haven't tried it yet. Thanks for sharing! Made these for dinner and they have GREAT flavor. They are, though, really runny. I don't know if it was the type of beans I used (1 can regular, 1 can vegetarian) or brand, or the fact that the liquid isn't drained off the rotel. Ended up using it as a dip. I froze 6 of them and they microwave well, but I would say are still runnier than store bought. I think next time I will drain one can of the rotel and see if that helps the situation. Thanks for sharing! Hi Leslie! I've never had a problem with them being runny. Maybe it was the beans? If this happens again I would try to cook the filling mixture down until it thickens up more. Good luck! IVE TRIED A VERY SIMILAR RECIPE AND IT ALSO TURNED OUT RUNNY LIKE THE PICS ABOVE IN THE POST...IF YOUV ACTUALLY EVERY EATEN A STORE BOUGHT ONE THE FILLING CONSISTENCY IS NOT THAT RUNNY...NOT SURE IF THAT IS TYPICAL OF A BEEAN BURRITO UD FIND IN MEXIO CAUS IVE NEVER BEEN BUT THE NEXT TIME I MAKE THESE I WILL BE LEAVING OUT THE THE ROTEL COMPLETELY AS I DONT SEE THIS IN MY STORE BOUGHT AND MUCH PREFER THAT FLAVOR/CONSISTENCY COMBO. We sometimes add sliced green chilis especially for me since I have a tomato allergy. I never thought of freezing them for later. That's a great way to use the leftovers!!!!! They should last around 3 months in a regular freezer. I tried this today and they taste delicious! I loved the spiciness of it. Unfortunately, I do have to agree with the others that it is way, way to drippy. Eating them is a challenge and they look pretty rough due to the leaks. I bought all my ingredients at Aldi's so they should have been similar to yours but something must have gone haywire. Once I eat up this batch, I am going to try again and drain both cans of Rotel. They taste great and I love how cheap they are too. So worth experimenting on to get the right consistency. Thanks for the recipe! Thanks for sharing your experience. I hope the consistency comes out better next time for you! I just made this except I used the spicy versions or the refried beans and rotel. I also added a dash of Siracha sauce and added rice. They came out delicious! Thank you for this! I just made a batch today and can't wait to give my husband his lunch tomorrow! I made these this morning and I had one for lunch while the rest went into the freezer. They are filling!!! I forgot the Rotel but they were tasty without it. Next time I think I'll add it though along with some beef. Thank you for the idea! They are great with ground beef! Hello! I just made these and my husband and I love them! Do you happen to know the nutritional values for each burrito? How can you heat these in a microwave when they are wrapped in aluminum foil? You will need to remove the burrito from the foil before microwaving. This looks yummy and easy! My question is, you say use "2 cans Rotel" but what exactly IS that? I can't read the label on the can. Rotel is the brand name for diced tomatoes and green chilies. My husband suggested also adding a can of meaty chili to the mix. Thanks for sharing this recipe! We have an Aldi on the way home from work so I can pick these ingredients up when I don't feel like cooking dinner. A little sour cream along with chopped lettuce, and we're good to go! But what do you do when it’s time to cook to serve them? I cook mine in the microwave, but you could do it in the oven or toaster oven. do you have to use the foil? If you are going to microwave them you will have to remove the foil first, so is there another choice, like parchment or cling wrap that will work? No, you don't have to use the foil. i used wax paper for burritos i made last night. i usually make a big batch of pinto and or white beans in the pressure cooker. i rinse then soak the beans in the pressure cooker on the keep warm setting for an hour, then rinse a few times more, then cook for 30 mins on high pressure with various seasonings. the beans turn out mashable enough that i mix them with a can of refried beans, and roll into burritos with some shredded cheese. These sound great. However, every time I try to make burritos the tortilla breaks. I've tried warming them so they're more pliable, but that hasn't worked either. Any ideas? Thank you. Are you using flour tortillas? I know corn tortillas will break easily. The only thing I would suggest is to maybe try a different brand of tortilla and warming them up again.